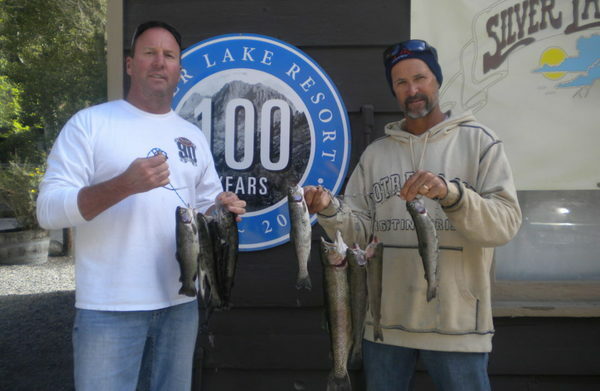 The weather here at Silver Lake has been spectacular the last week with some warm weather during the day and some afternoon rain showers most afternoons which has made the fishing at Silver Lake a week to remember as we have seen a tremendous amount of stringers and larger 2 to 3 pound Rainbows brought in throughout the week. 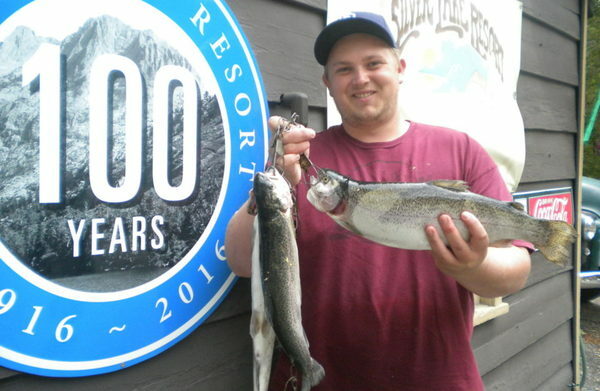 Fishing has been great whether you are in a boat or fishing from the shore as anglers have had great success everywhere on the lake. We have seen the best and most consistent results with all Berkley Power Baits, Pinch Crawlers and Mice Tails – in all colors – at all times of the day and good results with anglers using Night Crawler worms early and late when the water is cooler and the fish are feeding more in the shadows of the lake. Once the sun hits the water and starts to warm it up, switch things up to the Power Baits and Pinch Crawlers at the bottom of the lake with a 30-36″ leader line. Trolling has also showed some great results taking your trolling rigs deeper in the water for best results. If you use lead core line look to go about 4 to 5 colors deep, if you are using a traditional outfit put a keel sinker on to help get you deeper into the cooler water and use some Tasmanian Devils – like a Pinky, Red Wing or Fire Tiger or some Rapalas also with some bright colors in it like a Rainbow Trout. If you like to toss a lure look to use some Kastmasters like a Rainbow or Brook Trout Pattern and Gold/Red Thomas Buoyant. Do you see a pattern of bright color working well?? Its no fluke!! The water levels are staying extremely high on Silver Lake and Grant Lake continues to increase in level on a daily basis so as we start to think about Fall, water levels are looking great!!! July has slipped past us already and August is here which means Summer is winding down. Don’t wait to come on up and enjoy all the beauty The June Lake Loop and the entire Mono County Region have to offer. 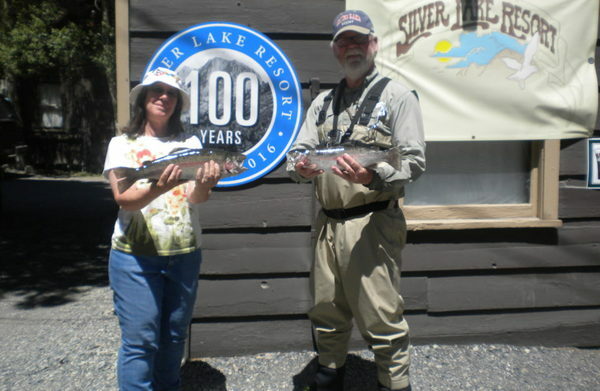 Come on into the Silver Lake Store and grab all your Silver Lake Resort 100th Anniversary items before they are gone!!! David Piolatto of Newhall had a great week fishing on Silver Lake capped off with this nice 4 pound 7 ounce Rainbow caught using a Yellow Garlic Worm. Great Week by the Piolatti, Ciabattari, Regli and Watson Families!!! Good work by everyone!! !